This is indeed 1 of world's 'biggest puzzle' that had kept everybody talking @ kopi tiams . Did she crashed into the sea or was she hickjacked? Are probably two important questions on everybody's mind now. These are also on minds of the anxious relatives/ friends of missing passengers on MH370. They must be eager to get answers to the whereabouts of their love ones. However the solutions are not easy even though many vessels and planes are being sent out to scout the possible locations of the missing plane. "New evidence have led investigators and experts to believe that communication on the missing flight MH370 might have been cut off on purpose. According to a report on The Star, ABC news said US investigators now believe the aircraft's data reporting system and its transponder -- which reports its position in flight to ground-based radar -- shut down separately. The devices appear to have been shut off 14 minutes apart, suggesting that they may have been deliberately disabled or at any rate did not fail as a result of a catastrophic airframe incident. The transponder was switched off 30 minutes after the final voice communication from the cockpit, around the same time that Malaysia believes the plane may have inexplicably started to turn back, the Washington Post said. One US flight crash expert was quoted as saying that these put together "suggest that someone unauthorised took control of that airplane, like an intruder or one of the pilots". According to data obtained, the reporting system was shut down at 1.07am (Malaysia time) and the transponder at 1.21am. Malaysian officials reported that the plane lost radar contact at around 1.30am, less than an hour after take-off. They have confirmed that the last words heard from the cockpit were a relaxed "Alright, good night" as the plane was due to pass from Malaysian to Vietnamese air traffic control. The night was clear and the weather was fine. missing in airspace controlled by Vietnam on Mar 8. 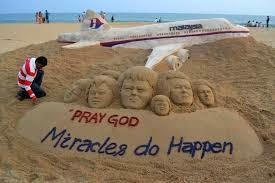 Today (14 Mar 2014 )marks the seventh day of the search for MH370." Hope there are survivors on the plane.